Have you ever heard this chorus? Maybe you sang it as a kid? Or better yet, had it sung to you? Oh no, I can just hear the collective inward and outward groans abound as you read the word patience. Who wants to learn patience? “Let’s pray for patience” said no one ever, especially if they have already done so. Patience as defined in the dictionary is: the capacity to accept or tolerate delay, trouble, or suffering without getting angry or upset. #Patience is to tolerate delay without getting upset. Patience is a fruit of the Spirit and some say it’s a virtue. Patience is something that is often hard to come by in the fast pace, fast food, “I want it my way, and I want it now” society we live in. Yet, we are told clearly in Scripture more than once to wait and have patience. Like Habakkuk, have you asked #God How much longer wickedness and evil will continue? Habakkuk is upset and frustrated and God answers him with words of hope and instructions to wait on God’s timing and His plans. 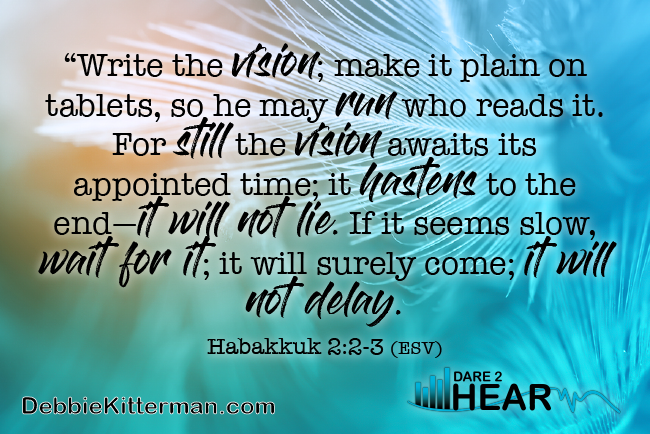 Something Habakkuk was having a hard time with, so God tells Habakkuk to write out the vision, and keep it in front of himself and the people. Not just speak about it, pray about it, or declare it, but to also W-R-I-T-E it out. To write it out, so that no one can mistake what God spoke, or misunderstand the hope and instructions He gave. #God wants us to #write out the vision He has given us. The same is true for us. 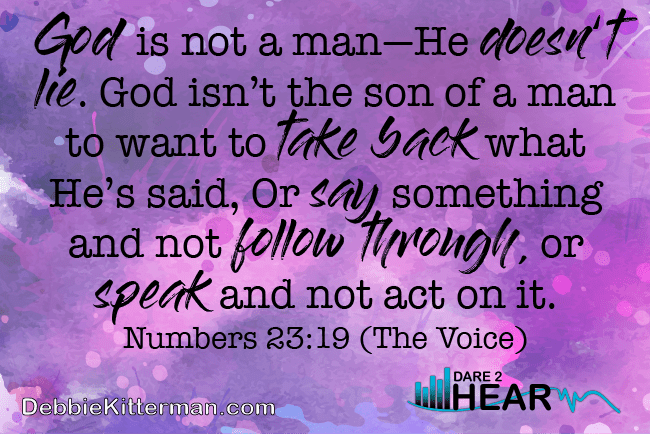 When God speaks to us and fills our hearts with dreams, visions and promises, He wants us to write it out, to speak about it, pray about it, and declare it over our life. He wants us to be patient, to trust Him and to keep our eyes focused on Him no matter obstacles come our way. You will find that when God gives you a dream or vision it often comes with obstacles. 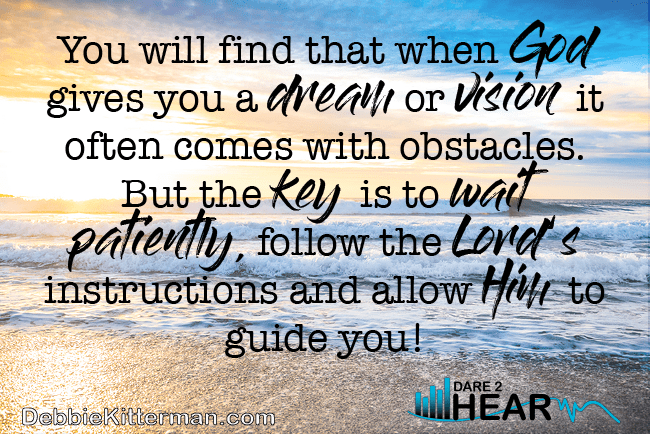 But the key is to wait patiently, follow the Lords instructions and allow Him to Guide you! The enemy likes to try to get our eyes off of what God has promised and onto the obstacles that he throws in our way. Remember, God is always true to His word. If He said it, He will do it. Not our way, but His. Not on our time table, but His. We must patiently wait for it, even if it is slow in coming. Has God given you a dream or a vision? Have you taken the time to write it out? Have you already seen it come to pass? Or are you waiting for it to come about? Just as the title graphic image below, sometimes, we have to wait for the tree to grow and fill the space between the gap of where we are now, and where God wants us to be! I have to say, I enjoyed all your posts, and it was difficult to narrow it down and to pick just a few to highlight this week. I hope you enjoy this new addition. Please make sure to visit the post before yours and share some comment love as well as one other of your choice. Nysle Esahc wrote about 10 ways we can respond to those individuals I like to call “Grace Growers.” It seems lately, I have had a lot of opportunities to put into practice these 10 tips from Nysle. Maria Brittis shared her homemade potpourri recipe: ROSE AND LAVENDER POTPOURRI RECIPE What a great way to preserve and extend the life of flowers you may have been given as a gift. Love that verse from Habakkuk! I look back on things He’s revealed and completely forgotten the details. Writing it down is such a vital step! Thank you for featuring me this week!! Thank you Rachel! I love the way God works to confirm things He is speaking to us 🙂 Hopefully, you were able to fall back asleep after being woken up like that. Thanks for sharing in the comments today. Thank you so much for the party, Debbie. Have a great day! You are most welcome Jas! I always look forward to your posts. Oh that word “patience” is the first lesson of this year connected with my one word of sufficient! Waiting as I heard the Lord say to “be patient” with the searching of the right medication is definitely not easy! But HE is so trustworthy as I keep my focus on Him! Thank you for this confirmation that I needed to hear today. Oh Bettie, yes, I can see how ‘patience’ is connected to sufficient, but you are right, the lessons and the waiting are so not easy sometimes. 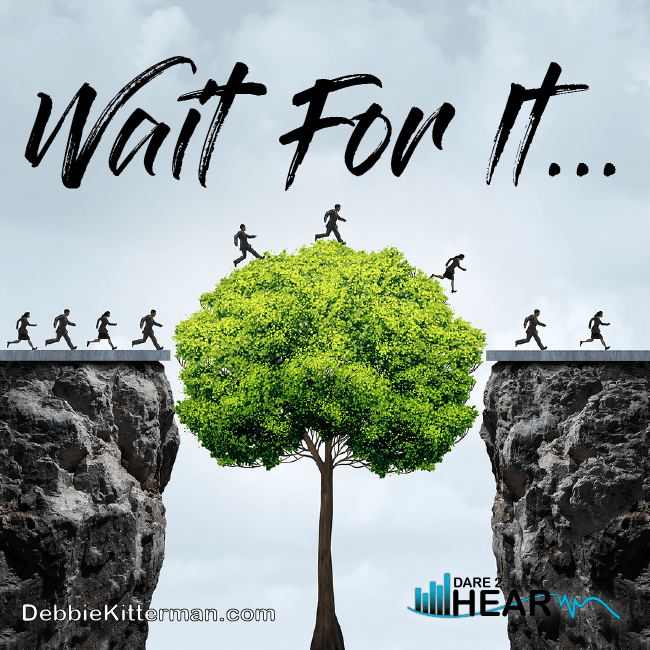 I am in the midst of waiting for a lot of things, that I would rather not have to patiently wait for, like medical test results. You are so right, keeping our focus on Him and knowing He is trustworthy makes a huge difference. You are most welcome for todays post, I needed it as much as anyone and I am glad it gave you the confirmation you needed too. Blessings my sweet friend! I was just working on a piece about patience and it occurred to me that all the other fruit of the Spirit are enhanced if we are practicing patience. We so need His help with this one! Prayed for patience once. Never will again!!! So far so good Lisa! So very true. Thanks for sharing this. I need to always remember this. Thanks for hosting and I hope you have a wonderful week. Thanks Patrick! You are most welcome, so glad to give you the reminder 🙂 You have a wonderful weekend as well. Marilyn – I saw the sweetheart bark earlier and it had my mouth watering! yummy and what a great idea for the red wings popcorn in time for Super Bowl Sunday! There are so many promises in God’s word associated with waiting on Him. Patience comes with lots of rewards! I despise waiting but I have learned to wait well most of the time. I like what you said about writing your vision out. Thanks Maree and you are not alone in despising waiting – I am glad you have leaned the part about waiting well, at least most of the time. That is a lesson, I apparently still need to learn myself. I am in the midst of waiting on something right now that is 2 weeks over the deadline and out of my control…. definitely an act and lesson in patience, but it’s not fun. Thanks so much for joining the Grace at Home party. I’m featuring this week!